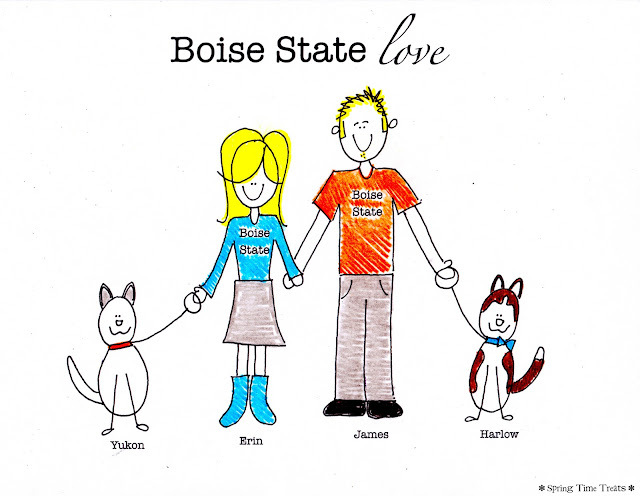 Erin's family & some Boise State love! I have a wonderful friend named Erin. Hum . . . how do I describe her . . . she has naturally very blond hair, she's very smart and very hilarious. While I was drawing her cute family many memories came to mind. A british date I was nervous to go on and she doubled with me . . . I still owe her for that. Many plays in high school, Dracula's Castle will always be a horrible favorite of mine. And our director coming down on me because I was talking too fast (I still struggle with this when I get excited) and Erin stood up for me, told him to back off and leave me alone. ha ha. Erin and her man are proud Boise State Alumni. My husband is from Boise so we also love the Broncos! No, Erin does not have cats, they are adorable huskies (or malamutes). As you can probably tell I have never drawn dogs, and especially dogs who have pointy ears, trust me, these are the best ones I could come up with, you don't even want to see the rough drafts. I have perhaps one of the cutest little girls around. She loves to make paper dolls and I find her in a mess of paper, scissors, tape and coloring pencils almost daily. We wanted to share our paper dolls or I guess you might call them puppets since we put them on popsicle sticks, shish kabob sticks, pencils, or whatever we have on hand. Here is your free printable. Click on the picture and print, make sure it is scaled to full size before you print. I am working on attaching a PDF file, that would work so much better, but for now here you go. Welcome to Spring Time Treats. Part of me is excited to share this with you, and the other part of me feels like the biggest dork in the world. 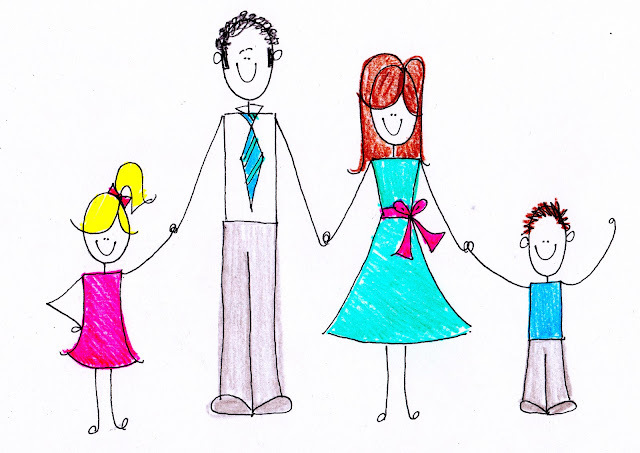 This all started a few months ago when an adorable girl was visiting and saw some of my silly doodles around the house and asked if I would draw a picture of her family (a stick figure portrait). I had never done anything like that before for someone else and I'm embarrassed to say how much fun I had drawing her cute family. While this is hardly a talent, I love sharing it and wanted to share it with more, and I think this will be the easiest way to do that. Let me know what you think.